The White House wish list for 2020 tots up to $4.7 trln, with a boost for the military and cuts for most everything else. It also counts on an unlikely 3 pct GDP growth rate to trim red ink over a decade. It’s a statement of position that gives Congress good grounds to ignore it. 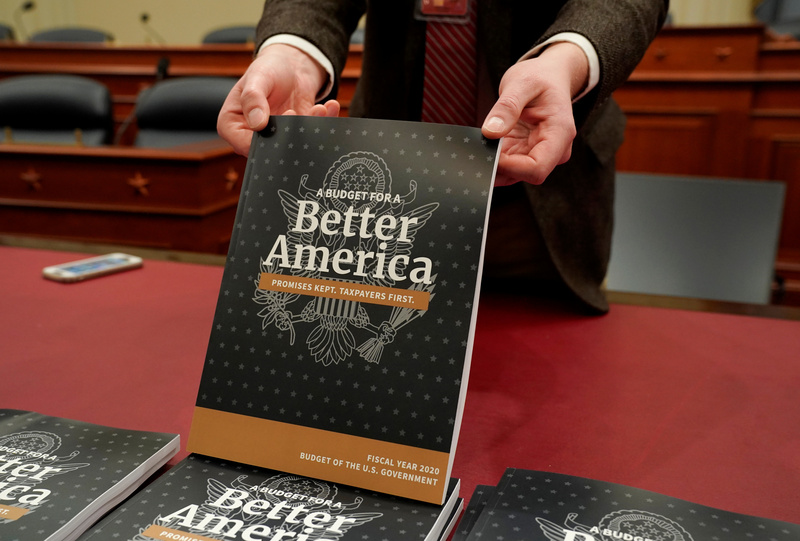 An aide holds up a copy of Volume 1 of U.S. President Donald Trump's budget for Fiscal Year 2020 after it was delivered by the Office of Management and Budget (OMB) to the House Budget Committee room on Capitol Hill in Washington U.S., March 11, 2019. U.S. President Donald Trump on March 11 called for overhauling social programs that help poor and elderly Americans while boosting military spending and funding a U.S.-Mexico border wall. In his $4.7 trillion 2020 budget proposal, Trump called for defense spending to rise by 5 percent to $750 billion. Non-defense spending would be held down thanks to steep proposed funding cuts of nearly a quarter for the State Department and almost a third for the Environmental Protection Agency, among others. The White House also proposed reforms to mandatory spending programs such as food stamps to cut $22 billion of outlays. Even with the cuts, which the White House said would add up to more than $2.7 trillion in savings over a decade, and an average of 2.9 percent annual GDP growth rate keeping tax receipts buoyant, Trump’s Office of Management and Budget said the federal government’s books would not balance until 2034.